Rather than prepare graduates for careers as attorneys, a legal studies degree prepares students for diverse positions, such as compliance officer, revenue agent, and human resources manager. A master's degree in legal studies (MLS) trains professionals in government, the private sector, and the nonprofit sector to apply legal analysis in their career. Earning a master of legal studies online degree prepares graduates for careers as compliance officers in the healthcare or finance sector, ensuring organizations follow applicable laws and regulations. Graduates also work as human resources (HR) managers in every sector, applying their legal studies training to HR policies and procedures. An MLS degree prepares students for careers in operations management or business analysis as well. Many of these careers offer lucrative salaries and high growth. According to the Bureau of Labor Statistics, HR managers earn an average of over $110,000 a year. This article introduces the best online master's programs in legal studies. It also explores career opportunities and salary potential for graduates with a legal studies master's degree. What is a Master's in Legal Studies Degree? What Can You Do With a Master's Degree in Legal Studies? University of Oklahoma - Norman ranks #1 on The 8 Best Online Master's in Legal Studies Programs! OU offers three unique master's in legal studies programs designed for working professionals. Each MLS program is delivered asynchronously and in an accelerated format. Students can earn their master's in legal studies online in 15 months. The programs are ideal for professionals who are not lawyers but who need legal knowledge to support their career activities. The MLS in oil, gas, and energy law requires 32 credits and a one-week campus residency. OU has provided energy education for more than 100 years. Students have access to oil and gas companies and leaders in directional drilling, and program faculty are experts and practicing attorneys in oil, gas, and energy law. Students earning the MLS in indigenous peoples law benefit from OU's location in the heart of the original Indian Territories. The 33-credit curriculum teaches students the complexities of federal Indian law while expanding their knowledge of contracts, negotiations, and other aspects of Native American self-governance, policy, regulation, and business practices. Graduates of OU's MLS in healthcare law program work in areas of compliance, advocacy, contract negotiation, and real estate transaction. The 32-credit program requires a week-long capstone residency at the OU Health and Sciences Center in Oklahoma City. In-state students receive discounted tuition rates. Applicants must submit official transcripts, a resume, and a personal statement. International students must submit TOEFL exam scores. The University of Oklahoma is regionally accredited by the Higher Learning Commission (HLC). University of Illinois at Springfield ranks #2 on The 8 Best Online Master's in Legal Studies Programs! The master's of arts in legal studies at UIS develops critical and analytical skills through coursework examining the legal system's role in society and public policy. The degree is ideal for students planning to pursue careers as investigators or resource persons and for those who want to enforce compliance with the law, work with legal forms and requirements, or understand how legal regulations affect businesses. The online and on-campus programs follow the same rigorous, 40-credit curriculum. The fully online courses may be delivered synchronously or asynchronously, depending on the professor's preference. Students work with professors to tailor the online master's in legal studies program to their individual needs and interests. Required preliminary and core courses include legal research and citation, introduction to graduate legal studies, theories of justice, and public advocacy. Students engage in clinical education and are encouraged to choose a focus area, such as law and public policy, human rights and social justice, or regulatory compliance. Students must complete a thesis project. Applicants must have a bachelor's degree with a minimum 3.0 GPA, although exceptions may be made for applicants with significant professional experience or qualifying graduate work. Online applicants must also demonstrate good written communications skills. The University of Illinois is regionally accredited by the Higher Learning Commission (HLC). Drexel University ranks #3 on The 8 Best Online Master's in Legal Studies Programs! Professionals who want to improve their career-related skills in specialized legal areas should consider Drexel's online master's of legal studies. Drexel is known for its interdisciplinary approach to applied education; faculty members use each student's professional knowledge and experiences as the foundation for their education. Drexel's master's of legal studies program offers eight concentrations, some of which award graduate certificates. Available concentrations include criminal law, HR compliance, cybersecurity and information privacy compliance, and NCAA compliance sports law. The online master's of legal studies requires 30 credits and culminates in a capstone project. Online students have access to 24/7 tech support and an online library, writing center, and career center. Graduates with the healthcare compliance concentration are eligible to sit for the healthcare compliance and compliance and ethics professional certification exams. Drexel offers discounted tuition rates for alumni, military members, and employees and members of partner organizations. Applicants must submit official transcripts, a resume, a 500-word essay, and two letters of recommendation. Saint Leo University ranks #4 on The 8 Best Online Master's in Legal Studies Programs! Saint Leo's online master's of science in criminal justice with a specialization in legal studies is designed for professionals who work within the court system, the government, and emergency agencies. The program requires 36 credits and covers topics such as public policymaking in criminal justice, the impact of terrorism on homeland security, hostage negotiations, and courtroom psychology. Students are prepared to manage the aftermath of disasters and to decrease the impact of hazardous situations. Saint Leo, one of the leading military colleges in the U.S., was the first Catholic school in Florida to offer online learning. Saint Leo provides an online learning toolkit to help prospective students understand the basics of online education. Saint Leo accepts applications on a rolling basis. Applicants should have a bachelor's degree with a cumulative 3.0 GPA and must submit official transcripts. Applicants who do not meet the GPA requirement must submit a 500-word personal statement. Transfer students can bring up to six previous credits earned with a grade of B or better. Saint Leo University is regionally accredited by the Southern Association of Colleges and Schools Commission on Colleges (SACS). Arizona State University–ASU Online ranks among The 8 Best Online Master's in Legal Studies Programs! In 2018, U.S. News ranked ASU as the most innovative school in the nation. The faculty who teach ASU's master's in legal studies online degree boast a combined 300 years of experience and are nationally recognized in the legal field. ASU's master's of legal studies provides a basic understanding of law, U.S. legal structures, and legal reasoning. The curriculum offers five concentrations: sports law, law and sustainability, HR and employment law, intellectual property law, and criminal law. Coursework helps students identify potential legal issues unique to each concentration, and the flexible program allows students to pair their study of law with other fields of interest. Most students complete the 30 required credits in 18 months. Graduates pursue careers as chief executive officers, compliances officers, contract managers, patent officers, and sustainability managers. The admissions process considers each applicant's academic potential and career ambitions, along with the law school's available space and resources. Applicants must have an undergraduate degree and must submit official transcripts, a resume, a personal statement, two letters of recommendation, and a writing sample. Northeastern University ranks among The 8 Best Online Master's in Legal Studies Programs! Founded in 1898, NEU is a global research university located in the heart of Boston, with five satellite campuses in the U.S. and Canada. For professionals who work with attorneys and legal issues but who do not wish to become lawyers, NEU's master's of legal studies enhances students' understanding of law and how it impacts the regulatory terrain of specific disciplines. Students earning NEU's master's of law degree online learn from law school faculty and industry experts. Professors customize courses with content relevant to specific professionals. Coursework emphasizes experiential and collaborative learning to help students understand the practical application of legal and regulatory principles and learn how to use the law to achieve organizational goals. NEU's master's of legal studies program requires coursework in the law of information and records, law and strategy, negotiation and advocacy, regulation and compliance, and organizational management. All courses are delivered asynchronously, and part-time students typically complete the required 30 credits in 18 months. Applicants should have a bachelor's degree and must submit official transcripts, a resume, a personal statement, and two letters of recommendation. International students should also submit TOEFL scores. Northeastern University is regionally accredited by the New England Association of Schools and Colleges (NEASC-CIHE). West Virginia University ranks among The 8 Best Online Master's in Legal Studies Programs! WVU offers an online master's of legal studies designed for professionals in occupations governed by laws and regulations, such as positions in human services, juvenile justice, and social work. The degree helps professionals understand the law and advance their careers. The faculty who teach courses in the online master's of legal studies program boast numerous awards and achievements in their fields. Many of WVU's instructors have worked for national companies and organizations, such as Procter and Gamble, the U.S. Foreign Commercial Service, and the World Wildlife Fund. The 36-credit curriculum includes coursework in law and the legal system, researching the law, administrative legal process, the legislative process, and alternative dispute resolution. Students can pursue approved electives through directed or independent study. The program culminates in a research paper completed during a capstone class. Most students earn the online master's of legal studies in two years. WVU's enrollment coaches prepare students for online learning. Applicants must have a bachelor's degree with a minimum 2.75 GPA and must submit official transcripts, a resume or curriculum vitae, a personal statement, graduate aptitude test scores, and two letters of recommendation. West Virginia University is regionally accredited by the Higher Learning Commission (HLC). Hodges University ranks among The 8 Best Online Master's in Legal Studies Programs! Hodges offers a master's of science in legal studies that is ideal for professionals who regularly work with lawyers or legal issues. The program also prepares students to teach law and to advance to administrative positions. The program is available in a fully online, accelerated format, which most students complete in about a year, or in a hybrid format. The 30-hour curriculum comprises 10 required courses, including a capstone course. Each of Hodges' law professors holds a JD. Hodges' online master's degree in legal studies prepares students for careers as conflict resolution specialists, contract administrators, legal assistants, jury consultants, court advocates, and investigators. During the admissions process, Hodges assigns each applicant an admissions coordinator. A committee evaluates each prospective student's application, personal essay, and most recent 60 hours of academic work, which should have been earned with at least a 2.75 GPA. Each applicant undergoes a 30-minute interview with the department chairperson, which may be completed virtually or in person. Hodges University is regionally accredited by the Southern Association of Colleges and Schools Commission on Colleges (SACS). A master's degree in legal studies prepares graduates for careers in the legal services industry. Legal studies students learn how to apply legal knowledge in fields such as business, finance, healthcare, and HR. Master's students complete coursework on legal analysis, jurisprudence, and the legal process, receiving advanced training for legal services careers. Most programs offer concentrations to specialize the degree. For example, students may pursue a taxation specialization, which emphasizes tax laws and regulations and prepares graduates to work as compliance officers or as a revenue agent for the IRS. A healthcare compliance concentration trains graduates for careers as compliance officers in the healthcare sector. Graduate students complete advanced coursework within a concentration and many programs require a project or master's thesis. Industries that face strong federal regulation, like finance and healthcare, often rely on professionals with legal studies training to ensure their compliance with laws and regulations. In addition to careers in business, finance, healthcare, and HR, graduates also work for federal, state, and local government agencies, providing legal analysis and ensuring compliance with regulations. Online graduate students complete core classes, electives, and courses in their concentration area. They take examinations, write research papers, and complete projects, just like on-campus students. At many institutions, on-campus and online students follow the same curriculum to earn a master's in legal studies. Colleges and universities often issue an identical diploma for online and on-campus students and many online students attend on-campus graduation ceremonies. However, online programs differ from on-campus programs in several ways. Online programs offer greater flexibility, often providing course material with no required class meeting times. The flexible schedule of an online program benefits working professionals and students balancing school with family obligations. Online students may enter the program in a cohort of students and complete the curriculum on the same schedule as their peers or advance through the material at their own pace, depending on the program. Online graduate programs also offer increased accessibility, enabling students to attend the top programs in the country without relocating. While some programs require on-campus residencies as part of the degree, others offer a fully online route to a master's in legal studies. Self-motivated students often thrive in online learning environments. An online master of legal studies offers several career advantages. A legal studies master's degree trains professionals in legal analysis, which prepares graduates for several in-demand careers. Graduates work as compliance officers, for example, ensuring that an organization follows applicable laws and regulations. They also work in healthcare management and management analysis. While a bachelor's degree in legal studies leads to opportunities as a paralegal, court clerk, or law enforcement officer, a master's degree leads to high-level positions in business and government. A master's degree in legal studies qualifies professionals for management-level roles, such as HR manager, operations manager, and chief compliance officer. The legal services industry offers diverse career opportunities in business, administration, and HR. Compliance Officer: Compliance officers ensure that a company or organization complies with regulations and laws. They monitor licensing requirements, create reports on compliance, and make recommendations. Compliance officers may work in healthcare, financial services, or other industries. Operations Manager: Operations managers oversee the production of goods and services, including compliance with safety and environmental rules and regulations. They also manage budgets and daily business operations. Chief Compliance Officer: Chief compliance officers oversee a company's finances and operations, adhering to rules, regulations, and laws. They monitor budgets, create procedures that follow safety standards, and grant permission for new initiatives. Human Resources Manager: HR managers oversee the HR department, including setting policies and procedures. They ensure compliance with federal, state, and local regulations and oversee staff members. Management Analyst: Management analysts research and analyze an organization's operations and make recommendations. Specialists in corporate law or taxation may recommend policies to increase efficiency or compliance with legal regulations. 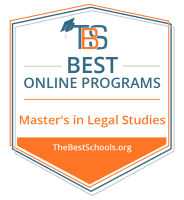 When considering an MLS degree online, prospective students should carefully research each school to find the best online master's in legal studies for their goals and interests. Students should consider factors such as program cost, transfer policies, and program length. Some programs, for example, offer accelerated options for students who want to earn their degree quickly. Online programs may also include on-campus requirements, which prospective students should ensure they can meet. Additionally, students should research the best online colleges in each state. Program Cost: The cost of an online master's in legal studies varies by institution. In-state public schools typically charge the lowest tuition rates, though many institutions offer a flat rate for online students regardless of residency. In addition to tuition, prospective students should research technology fees, online fees, and book costs. Transfer Policies: Some programs accept transfer credits from accredited graduate programs. Transfer policies vary by institution, as do the number of transfer credits that students can apply toward their degree. Prospective students should check the transfer policy for each potential program. School Size and Type: Large and small institutions offer online legal studies graduate programs. Prospective students may prefer higher class sizes with a larger cohort of students or a smaller program with a lower student-to-faculty ratio. School type, such as private or public, can also play a role in finding the best program. Public schools are typically more affordable but private schools often offer more financial aid options. Program Length: Program length depends on several factors, including required credits, enrollment status, and internship requirements. Some legal studies master's programs take a single year to complete, while others require two years of study. Whether a student studies part time, full time, or on an accelerated track also influences the degree completion time. On-Campus Requirements: Online programs may require on-campus residencies. Some programs host an orientation on campus, while others include residency weekends for students to complete in-person degree requirements. Additional programs offer a fully online learning environment without on-campus requirements. Thesis, Fellowship, and Work Requirements: Legal studies programs may include a master's thesis or research project at the conclusion of the coursework. Students conduct research under the direction of a faculty adviser. Some programs also include an internship to build professional experience. Prospective students should only consider accredited master of legal studies online programs. Accreditation recognizes colleges and universities that follow the best practices for educating students. During an accreditation review, an independent, nonprofit agency evaluates the institution on its student learning outcomes, graduation requirements, and faculty qualifications. Accredited degrees meet the qualifications for professional licenses and certifications, and some employers prefer candidates with an accredited degree. In addition to regional and national accreditation, which evaluate an entire college or university, programs can earn programmatic accreditation. Specialized programmatic accrediting agencies review a program or a school within an institution, such as a business school or teacher training program. The American Bar Association accredits law schools, which often offer master's in legal studies programs. How Long Does It Take to Complete an Online Master in Legal Studies Degree Program? Earning a master of legal studies online typically requires 30-36 credits and takes one to two years to complete, depending on the program. Graduate students take coursework in legal studies, including within their concentration. The curriculum prepares graduates for careers in compliance, operations management, and human resources. Programs may also require an internship or practicum to gain hands-on experience, and some students complete a master's thesis or capstone project. Most online master's in legal studies programs offer part-time schedules, which appeal to working students. In some programs, legal studies graduate students complete as little as one course each term. Other programs offer accelerated options for students who want to earn the degree in less time. Students interested in an accelerated option should research transfer policies to receive credit for graduate-level work. Some legal studies programs offer concentrations to students interested in a particular topic or career path. The following concentrations are common among programs that offer a master's in legal studies online. Within a business or corporate law concentration, graduate students study legal analysis, law and regulation compliance, and federal taxation. They may also specialize in financial services, the insurance industry, or another business sector. A taxation concentration focuses on tax laws and regulations. Students can choose to specialize in corporate taxation, nonprofit taxation, or another subfield. Students learn about federal tax regulations, tax law, and corporate financial regulations. The concentration prepares for careers in compliance and budget analysis. With a concentration in HR compliance, students study the laws and regulations around employment law. The concentration may cover benefits policies, discrimination and harassment training, and hiring practices from a legal standpoint. This concentration prepares graduates for advanced positions in HR, including HR manager. In a healthcare compliance concentration, graduate students examine healthcare laws and regulations that shape the industry, including local, state, and federal regulations. The concentration prepares graduates for careers as healthcare compliance officers. Graduate students interested in intellectual property can focus on patent law, copyright regulations, technology, or trademarks. The concentration emphasizes the laws and regulations around intellectual property, and some students focus on science, technology, or engineering. Students study the connection between intellectual property and trade secrets in the tech and entertainment industries. While courses in legal studies programs vary by school, the following courses are common among online master's degrees in legal studies. This course provides students with an introduction to the legal system. Students learn about the court system, types of law, legal professions, and how laws are created. This course prepares students for careers as paralegals, legal assistants, and other professionals in the legal services field. This course teaches learners to analyze cases, statutes, laws, journal articles, and administrative rulings. Students learn how to write case briefs, opinions, and memoranda, preparing for careers in legal writing. This course focuses on the development of legal principles throughout history. Students compare historical legal trends to current trends to understand how and why the law has developed. In compliance and enforcement courses, students study the regulations and laws that apply to different organizations. The coursework may address corporate compliance enforcement, internal compliance procedures, and risk management. Students may also learn about regulatory compliance at the local, state, and federal levels. Legal studies students pursuing a business or corporate law concentration learn about different business structures and regulations. They may study shareholder rights, fiduciary duties, corporate regulations, and business law. The class prepares graduates for careers in business law. American Bar Association: In addition to representing lawyers, ABA also offers resources for legal studies students and professionals in legal fields, such as continuing education courses, online resources, and specialized legal information. ABA also provides professional development tools and a legal career center for job seekers. National Society of Compliance Professionals: A nonprofit organization focused on compliance professionals in the financial services sector, NSCP offers continuing education resources, regulatory information, and events with networking opportunities. The society also provides online job postings and a resume bank. Society of Corporate Compliance and Ethics: A professional organization for compliance and ethics professionals, SCCE hosts international conferences; offers certifications; and publishes magazines, newsletters, and books. The society also hosts a job board, provides a salary survey, and offers educational programs. Academy of Legal Studies in Business: Founded in 1924, the ALSB represents legal studies educators in business and law schools. The academy hosts conferences and publishes the American Business Law Journal, which offers resources on business law and education. Society for Human Resource Management: Focused on HR management, SHRM offers certifications, career planning resources, and educational programs. Members participate in local and national events, use SHRM's legal and compliance tools, and rely on the society for news.